I know I say this a lot, but we are coming off of such an emotional high after this weekend. 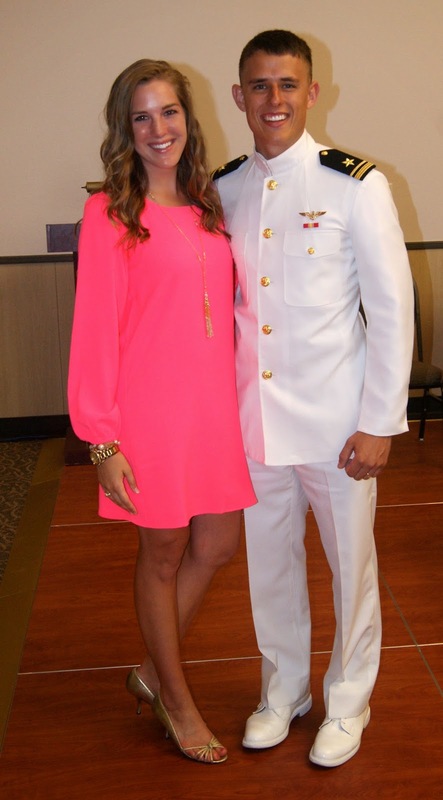 Parker is officially a Naval Aviator! Seeing those wings of gold pinned on his chest and knowing the hard work and dedication that they represent is just surreal. We can't stop smiling! My family wasn't able to come down for the actual winging (they made a special trip to visit us two weeks ago), but we were so grateful that Parker's family was able to make the trip. Everyone had a hand in Parker getting to this point, but his parents were pivotal, so it was so special that they got to stand up there with us as Parker received his wings. The weekend was short, but we packed in about as much as we could. I want to remember every little detail! We have been replaying our favorite moments in our heads over and over and are just on cloud nine. Thursday evening, Parker's family arrived. We decided to give them a tour of the flight line then rather than add that to the long list of things we had going on the day of the winging. There happened to be a T-45 on the flight line that day that had flown in from Mississippi, which was awesome. That is by far Parker's favorite plane that he flew in training, and that meant all three planes Parker flew were out on the flight line for him to show the family. We got to see the T-6, the T-45, and the T-44A. Parker is such a great tour guide, and his passion for flying just shines through. This guy loves what he does. Here's a shot of Parker showing everyone the T-45, his favorite training plane. 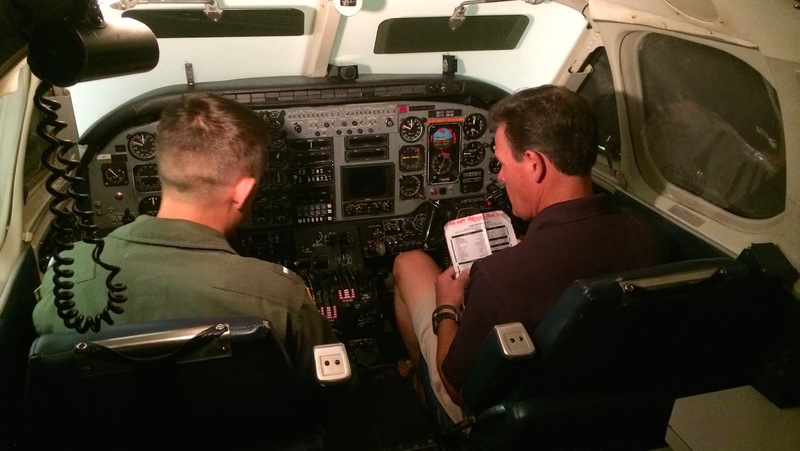 I also included a picture of Parker flying the simulator with his dad. That was one of his favorite parts of the weekend! I tried my hand at the simulator as well, but I think I am better suited away from the heavy machinery. We began the day of the winging with the Blessing of the Wings. This was a neat ceremony that the wingers could choose to participate in. It was held in the chapel on base, and wingers were able to pin a set of wings on a tapestry for everyone to pray over. Those wings stay in the chapel, and I love thinking about so many people praying over all of these aviators. 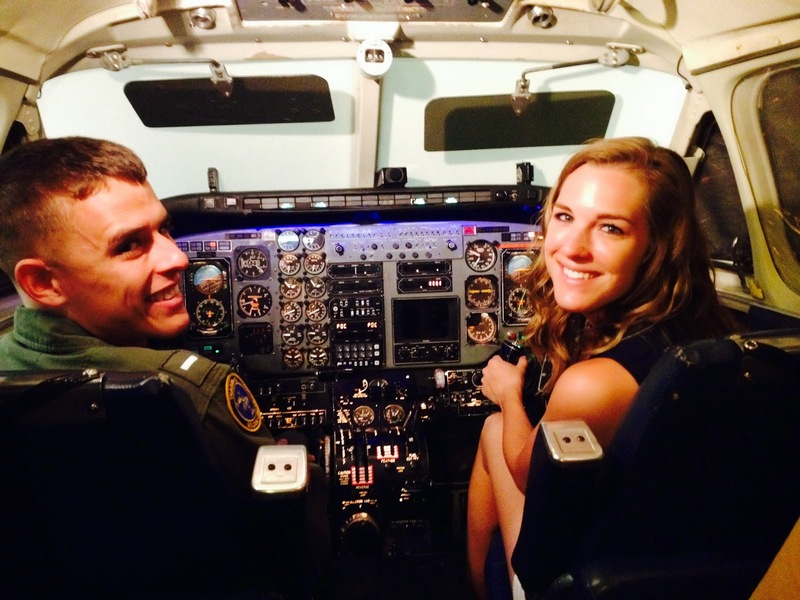 The next stop on our whirlwind of a winging day was breakfast with the CO (commanding officer) and the soft winging. The soft winging is the presenting of the new name patch with wings for the flight suit. Parker won't wear the nice gold wings unless he is in a nicer uniform, so this is a way to wear those wings proudly every day that he flies. I asked Parker at the end of the day what his favorite part was, and he said this was it. His CO said some really nice things about Parker that I think we will remember for a long time. After a family lunch at the casa and a walk along the water outside our house, it was finally time for the winging! There were several speakers, and I think they all did a very nice job. One of the speakers said something that stuck with me. He said that years from now, we won't remember the speakers. We won't remember everyone who received their wings with Parker. The details are going to get hazy, but we will remember the day Parker received his wings forever. It's a day neither of us ever want to forget. One of the first things they did was recognize the spouses. I have mixed feelings about this, but I really appreciate the acknowledgement and thought. On the one hand, the spouses did sacrifice a lot for these guys to get to this point. On the other hand, it's our job that we willingly and knowingly chose, and this day is all about the aviators. Regardless, it was neat getting to go up there and be presented roses by my handsome aviator of a husband. Next, it was time to pin on those wings of gold. The moment we had all been waiting for was finally upon us. I remember whispering to my father in law that my hands were shaking and I didn't think I was going to be able to pin the wings. I was just so excited and anxious and, not to mention, sleep deprived, that I couldn't get my hands to stop shaking. They called Parker's name, and his parents and I went up to pin the wings. 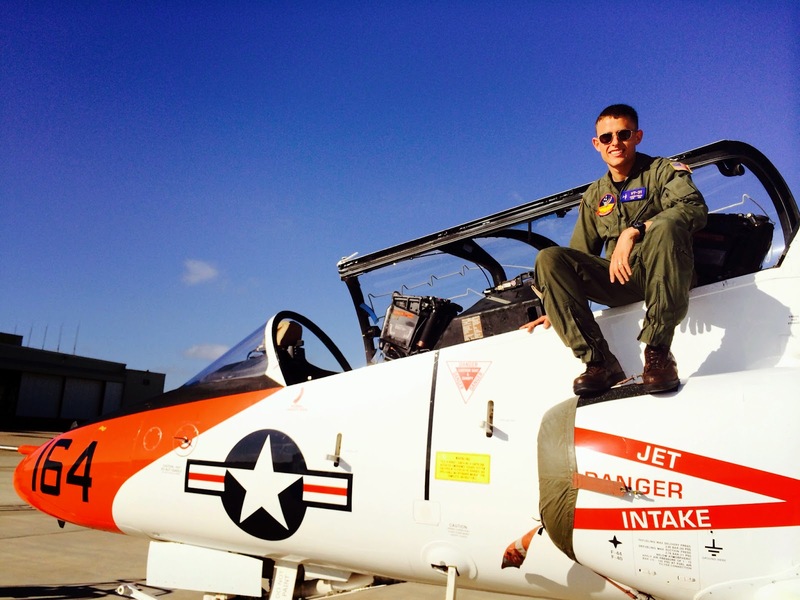 They announced him as the last student to ever fly the T-44A as they are retiring the plane after his class. Fun fact though, there were two students who flew the plane after Parker and another who flew it in the exact same flight as Parker, yet Parker is the one they distinguished for the honor. Oopsies! Pinning the wings on Parker was an absolute honor. With his parents looking on, he received his wings of gold. Naturally it took me about 45 seconds to get them pinned thanks to the shaky hands, but we'll just sidestep that one. We hugged and Parker decided to shake my hand after I finished, which I was afraid he was going to do. 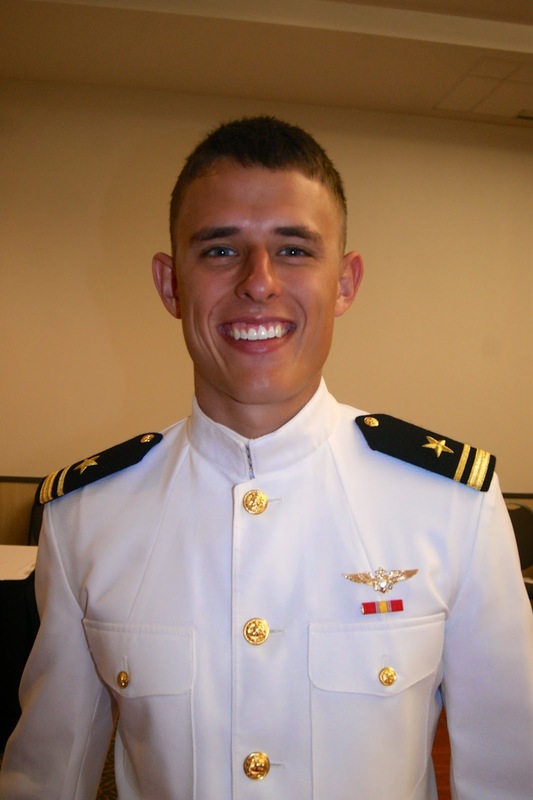 He accidentally shook my hand after his commissioning ceremony in 2011 because he was so used to shaking hands, so he did it at the winging to be funny. Apparently we have a very formal relationship over here! The whole thing felt like a wedding in a way. We planned the details for months and anxiously counted down to this day. We were giddy with excitement all day, so giddy that many aspects of the day are already a blur. And finally, driving to dinner after the day's events, we looked at each other and said "we need a vacation". True story. I feel like we should get to go on a honeymoon after getting through the winging, but I'll take a 24 hour road trip to Virginia instead. We are so grateful to all of the wonderful family and friends who helped us get to this point. Military life is a team effort, and all of the encouragement, support, and friendship we have received over the years has kept us going. Coming off of this weekend, I know two things. 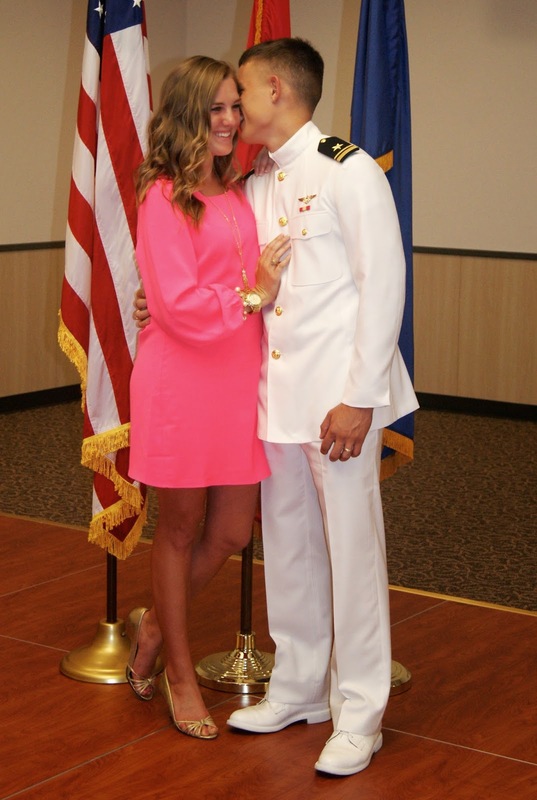 I am married to a Naval aviator, and we are blessed. Such a sweet weekend! Congrats to Parker on receiving those gold wings! He definitely wears them proudly :). And I'm so glad you blogged about the whole experience, not only for your readers, but for you and Parker to have to look back on many years down the road. Such a special moment! And girl, that dress is stunning on you!! Aww, it sounds like y'all had such a wonderful weekend. The ceremony sounds like an amazing experience. I hope y'all have a safe trip to Virginia. Such precious precious moments. Congrats again to Parker. You looked FAB, by the way. The hair, the dress. Love it! I would have been so nervous too! I love how they keep the wings in the sanctuary. I think that is so cool! Congrats on everything! So exciting for your family. PS. You looked gorgeous! Congrats to Parker!!! Such an amazing day for sure! Congrats that is such an accomplishment! Hopefully now things will relax for him with work some, I know it did for Joe. PS. you two make such a cute couple! Congrats Parker! And, side note, pink is definitely your color, friend! And omg I am laughing out loud at the thought of Parker shaking your hand! I'm really sad I missed that. Hahaha! That's too much and definitely something Ryan would do. As wonderful as it is to pin on the wings, it's always so awkward on how you want to conclude because you're standing in front of all those people plus you're nervous to begin with. Handshake for the win, indeed! Congratulations Parker! Chelsea, I love your hair and your outfit-- you look so pretty! Congrats to your husband! THat is such a huge accomplishment! P.s. your pink dress is super cute! Glad you guys had a fun weekend! FINALLY!!!!! Congrats to Parker!!! What an exciting journey for y'all!!! Congrats to both/all of you! That is so exciting! Your photos are wonderful, thank you for sharing them. We knew Parker and his family as he was growing up and I have loved following your blog, Chelsea! To see the wonderful man he has grown into and get to know his beautiful wife through this blog has been very special. Maybe someday we will get to meet you in person! Congratulations, Parker, on another great accomplishment. We will always be grateful for your service to our country! Be safe and give your family our love. Happy Birthday To The Birthday Boy!